President Barack Obama took time out from a NATO summit in Lisbon on Saturday to tout a new hybrid electric car which General Motors plans to roll out in Europe next year. 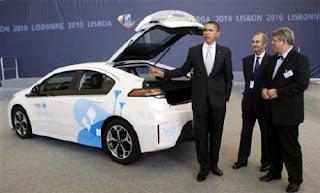 Obama found himself acting as salesman-in-chief for GM Opel's Ampera model just days after he declared in Washington that U.S. taxpayers would get their money back for saving GM in a bailout that was broadly unpopular. Calling the Ampera an "example of GM technology," Obama said: "This is the future." "This is a car made in America," he said after inspecting an Ampera at the convention center where he was wrapping up a two-day NATO summit. "We're going to start selling it in Europe." GM last week was refloated as a public company amid heavy investor demand, and the White House sought to take credit for what it saw as a successful turnaround. Public anger over the bailout, along with rescue packages for Wall Street banks, contributed to heavy losses for Obama's Democrats in the November 2 congressional election. But the stock sale capped GM's recovery from near-collapse, thanks to a $50 billion government rescue.